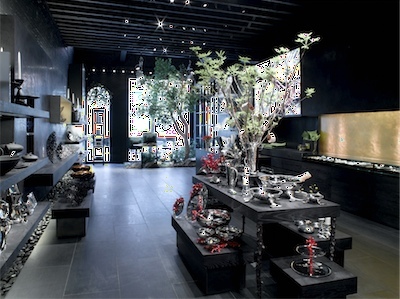 Celebrated metalware designer, Michael Aram – known for his unique treatments of organic themes in heavy metals – opened his first retail store this past year on West 18h Street in the heart of Manhattan’s exploding Chelsea home décor district. The store was featured in major press and was a big deal in the interior design world. Sold for almost two decades in high-end department stores and boutiques around the world, this opening marks Michael Aram’s first venture into retail. Lovingly restoring a landmarked 19th century carriage house from the inside out, the project has taken well over a year to complete. The structure maintains many of the architectural details from the original carriage house, such as the raised former loading dock that floats at the back of the room and the respectfully restored historical details of the front façade. 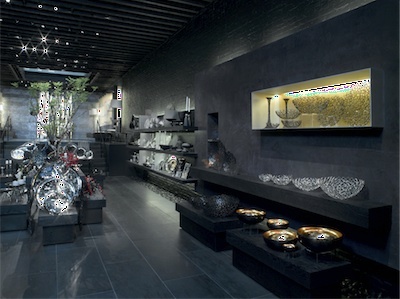 The Michael Aram Retail Store is located at 136 West 18th Street, NY, NY, 10011.